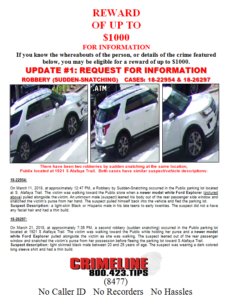 On March 11, 2018, at approximately 12:47 PM, a Robbery by Sudden-Snatching occurred in the Publix parking lot located at S. Alafaya Trail. 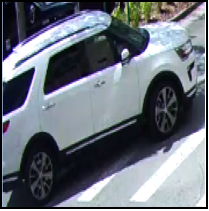 The victim was walking toward the Publix store when a newer model white Ford Explorer (pictured above) pulled alongside the victim. An unknown male (suspect) leaned his body out of the rear passenger side window and snatched the victim’s purse from her hand. The suspect pulled himself back into the vehicle and fled the parking lot. Suspect Description: a light-skin Black or Hispanic male in his late teens to early twenties. The suspect did not a have any facial hair and had a thin build. On March 21, 2018, at approximately 7:35 PM, a second robbery (sudden snatching) occurred in the Publix parking lot located at 1921 S Alafaya Trail. The victim was walking toward the Publix while holding her purse and a newer model white Ford Explorer pulled alongside the victim as she was walking. The suspect leaned out of the rear passenger window and snatched the victim’s purse from her possession before fleeing the parking lot toward S Alafaya Trail. Suspect description: light skinned black male between 20 and 25 years of age. The suspect was wearing a dark colored long sleeve shirt and had a thin build. If you know the whereabouts of the person, or details of the crime featured below, you may be eligible for a reward of up to $1,000.